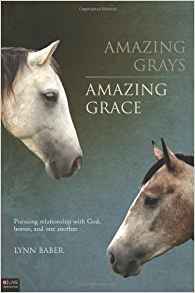 "Amazing Grays, Amazing Grace" is a collection of true stories and concepts that lead readers to an understanding of how horses help us to find a closer relationship with God. Woven into the fabric of these experiences shared by national or world champion breeder and trainer, Lynn Baber, is love, correction, wonderment, obedience, accountability, success, failure, birth and death. But the heartbeat that gives each life is relationship with God. Follow along as Bo and Swizzle, the amazing gray quarter horses, serve as both teachers and students in this unique book. Each chapter begins with a scripture, then uses the relationship between horses and humans to help the reader understand how it applies to their own relationships with Jesus Christ, parents, friends, and, of course, horses. How do horses think? How do we become worthy leaders? What is it like to be a horse show judge? How do stallions differ from other horses? What is the limit of possibility between a horse and human? How can we learn to live a life without fear? What is it that bridges the eternity between earth and heaven? It is grace - God's amazing grace. Thank you for your interest in Amazing Grays, an Amazon best-seller. To read more reviews, visit the book page on Amazon.com. For more on Gospel Horse or about me, visit my website at www.LynnBaber.com. I've added the link to my author page on Amazon below. This sounds good. I want to try it. But I wish there were more reviews. i want to read this sooo bad! Return to Share Your Favorite Inspirational Horse Books!.